Today’s headlines are filled with reports of the imminent fall of the Syrian city of Kobani to forces of the Islamic State (ISIS). There are terrifying descriptions of an imminent massacre and the looming threat to Turkey as Islamic State forces move ever closer to the Turkish-Syrian border. Turkish President Erdogan waxes poetic about how he “warned the West” about the threat IS would pose and the dangers of inaction. It seems that everyone, including security experts and pundits, agree that the situation is critical and that US bombardment alone is powerless to protect the town or halt IS. And yet, somehow lost amid the din of cries for intervention is the simple fact that it is US policy and the actions of the aforementioned Erdogan along with his counterparts in Saudi Arabia, Qatar, Jordan, United Arab Emirates, and Israel that created ISIS, nurtured it in its infancy, promoted its development, and unleashed it on Iraq and Syria. And now, for those same leaders, along with a chorus of interventionist voices in the media establishment, to sound the alarm is not only cynical and utterly disingenuous, it is a shining example of the arrogance of empire. As fighters of the Islamic State (IS) continue their charge towards the mostly Kurdish town of Kobani on the Turkish-Syrian border, deep cracks in the edifice of the US-led coalition against IS have begun to emerge. Diplomatic infighting has shattered the illusion of a cohesive and unified coalition cobbled together by Washington. Not only have a number of countries been apprehensive about getting deeply involved in yet another unwinnable war in the Middle East led by the US, some ostensible allies have used the crisis as an opportunity to achieve political objectives. Perhaps the world leader in cynical opportunism this week is Turkish President Erdogan who has thus far refused to involve his forces in the war on Syria unless that war has as its ultimate aim the toppling of Syrian President Assad. On October 7th, the NY Times ran a story with the headline Turkish Inaction on ISIS Advance Dismays the US which quoted a senior Obama administration official saying, “There’s growing angst about Turkey dragging its feet to prevent a massacre less than a mile from its border…After all the fulminating about Syria’s humanitarian catastrophe, they’re inventing reasons not to act to avoid another catastrophe…This isn’t how a NATO ally acts.” While the obvious implication is that Erdogan could cost the US the chance at a successful anti-terror operation, there is a subtle subtext that has gone almost entirely unnoticed; Turkey sees in ISIS an opportunity, not a threat. And this is precisely the point. IS is in fact a creation of NATO intelligence agencies (including Turkey), and it is achieving by force and propaganda what Washington, London, Riyadh, Doha, Tel Aviv, and Ankara never could – the expansion of the war in Syria. C.I.A. officers are operating secretly in southern Turkey, helping allies decide which Syrian opposition fighters across the border will receive arms to fight the Syrian government… The weapons, including automatic rifles, rocket-propelled grenades, ammunition and some antitank weapons, are being funneled mostly across the Turkish border by way of a shadowy network of intermediaries including Syria’s Muslim Brotherhood and paid for by Turkey, Saudi Arabia and Qatar… The Obama administration has said it is not providing arms to the rebels, but it has also acknowledged that Syria’s neighbors would do so. It should be emphasized and repeated from the mountaintops that Erdogan’s government, according even to senior Obama administration officials, has been intimately involved in hosting, arming, financing, and providing safe haven to precisely the same terrorists who today are regarded as the greatest threat in the region. The notion that “Syria’s neighbors” are providing arms is a not so thinly veiled reference to the key role of Turkish intelligence in coordinating the attempted regime change inside Syria. And so, when Erdogan demands a No Fly Zone in Syrian airspace as a precondition for Turkish boots on the ground, he does so knowing that Syria would rightly interpret a Turkish invasion as, well, a Turkish invasion. What is the relationship between Turkish intelligence, its secret base/training center at Adana, and the terror groups now subsumed into the group known as ISIS or the Islamic State? Does the Turkish government deny the countless media reports, including those by mainstream news outlets such as Reuters, alleging direct coordination of the terror elements inside Syria dating back to 2012? To what extent is Turkey using the rise of ISIS as leverage over both its “Kurdish problem” and its perceived regional rival in Iran? 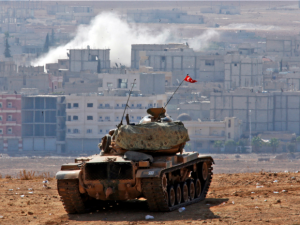 Does Turkey truly believe that it can effect regime change in Syria through ISIS proxies and still contain the threat to itself and its citizens? Naturally, such questions are unlikely to be asked, but positing them is critical if we are to cut through the propaganda now emanating both from Ankara and Washington. Each interested party responsible for the destabilization of Syria (US, Turkey, Saudi Arabia, et al) is busy trying to scapegoat the other in vain attempts to distance themselves from this crisis of their own making. Recent days have seen a flood of stories describing the imminent massacre about to unleashed in Kobani by ISIS. Much of what has been written has noted the obvious hypocrisy of intervention – that it is never applied equally, but only when politically expedient for the intervening country. In particular, focus has been placed on US intervention on behalf of Iraqi Kurds, and the conspicuous refusal to intervene on behalf of Kurds in Syria. Naturally, such a comparison begs the question as to the morality, not to mention political and military practicality, of such interventions. The implication is that “If it was good enough for Iraq, why shouldn’t it be good enough for Syria?” Never mind the fact that the US war in Iraq is one of the great crimes against humanity in recent decades, a nakedly imperialist war fought not for the Kurds, but for profit and geopolitical and strategic aims. Never mind the fact that Obama’s recent strikes inside Iraq had little to do with the Yazidi minority, and much to do with effecting regime change against Maliki and reasserting US influence in a country that had been moving rapidly into Iran’s sphere of influence. The Guardian published a particularly well-written op-ed which made just such a parallel. The author poses the following question: “Why did the United States rush to protect Kurds in Iraq – when Isis fighters started advancing toward Irbil and embarking on a genocidal rampage against the Kurdish-speaking religious minority Yazidis – but do little to save Syrian Kurds in Kobani from the same threat?” There is a deception, or at the very least a clearly dishonest equivalence made between the two, implicit in this question. Namely, that intervention in either case is actually intended to achieve the publicly stated objective. It is not. Quite the contrary, such humanitarian concern is merely the pretext by which US-NATO-GCC is able to carry out its military option for effecting regime change in a country that has steadfastly resisted it for three and a half years. The piece in the Guardian, like nearly every pro-intervention article written about Syria and ISIS betrays either an ignorance of, or more likely, tacit approval of, military aggression against Syria. Those who have been following the Syria conflict since 2011 know perfectly well that what we are witnessing is not a new development, but rather a realignment of propaganda strategy, a reframing of the issue from “down with the brutal dictator” to “down with ISIS.” This is the new false narrative with which the world is being presented. Either you must support military incursion into Syria without any coordination with the legally recognized government in Damascus, or you support ISIS and the slaughter of Syrian Kurds. This is a clever use of propaganda, not an honest examination of the material reality on the ground. The responsibility for what happens in Kobani must be laid at the feet of the real perpetrators: ISIS and its patrons and sponsors in Ankara, Riyadh, Doha, and Washington. Those who posture as if there is simply no solution to the situation other than more American bombs would do well to actually investigate the causes of this cancer in the region, rather than proclaiming their commitment to eradicating the symptoms. Perhaps their investigation could start with a few real questions for Turkey and the United States?